There is a small button below the search field. Click and you will see an area with filtering options. Verify that at least one is checked. Maybe the problem is there. Another good suggestion, but mine were all checked and it still doesn't work here. ...so we need to DL and reinstall the GSEs again? Just looked in my Product Library and the version listed is 1.13, is that the newest then? That will have to wait until I can get to the Hostpot tomorrow as a 430M file would take nearly a day with my slow connection from home. Firstly, let me congratulate all of you at DAZ for another amazing product. DAZ3D 4.6 is totally awesome! Well done. Installs easily, runs faster ( must have a turbo charger installed that we can't see....)!! And man, oh man, DAZ 4.6 renders at lightning speed. Only one small irritation though.....after downloading and installing 4.6, none of the other content such as 'Genesis Essentials" appeared in my DIM. Any ideas why? Not a biggy, I just installed them manually. Might be worth looking into tho'. Thanks again to the team at DAZ. Great stuff. After updating, all the smart content links are gone -- but I'm not sure how to "reimport the metadata in DS." I'v tried, in the content library pane, pick drop down menu at upper left, and select "scan known directories for files" which updates the content library pane but does not fix the problem with smart content. Could you be more specific about "reimport the metadata" please - I've gotten used to the smart content from 4.5 and would like to get it working again. Sometimes you can simply re-import the metadata for the content database and you will see your content items again. To manage this data, click on the 'Content DB Maintenance…' option. You may need to use this option a few times. This is how to access the 'Content DB Maintenance…' option in DAZ Studio 4.5. Go to the Content Library Pane (WINDOW –> Panes –> Content Library). In the Pane, find the 'Active Pane Options' button which is on the top. It will be on either the top left or top right, depending upon when the pane is docked. The button icon has four horizontal lines and a triangle. Click on the 'Active Pane Options' button in the Content Library Pane. A menu will appear. Find 'Content DB Maintenance…' in the menu and click on it. You will now see several options in the Content Database Maintenance Window. First choose 'Reset Database' and then click 'Accept.' It may not appear to do anything. Return to the Cotnent DB Maintenance Window and this time check 'Re-Import Metadata…' and click 'Accept.' You should see another window appear with all the metadata for the various content items listed in it. Press 'Accept' below. Now you should see a progress bar asDAZ Studio re-imports and thus rebuilds the database. It may take several moments to do this. If you see the progress bar flash very quickly or if it appears that nothing has happened, it is likely the database is broken and will need to be rebuilt as explained below. After the data files have been reimported, check the Smart Content Pane. If you still do not see any content, then proceed to the next step below." I can confirm it works. Hope this helps anybody with the same question. Reimporting hte meta data took me over half an hour. A sure sign I have been buying too much stuff. Love the new version and shaders though. The Data\auto_adapted directories are (usually) created in the first specified DAZ Studio Formats directory in the Content Directory Manager. Install about an hour or so ago. Installed no problems. Everything went well and my scenes load. Smart content and all libraries showed up perfectly. Did not uninstall prior version the installer did that. Have not checked all my plugins yet as I decided to do a test render which is running now. 1.13 is the latest. It's not crucial -- there are features added to the Genesis data files, but not having it won't break anything else. My old scenes seem to work fine. 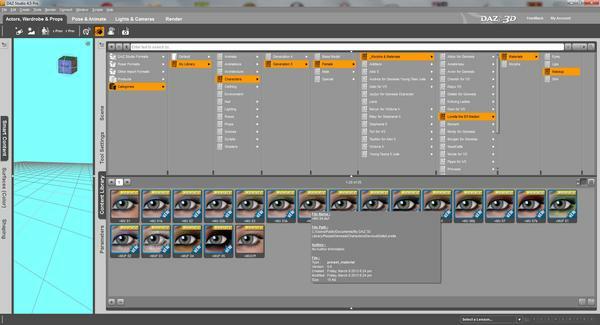 Do you have both the Scenes folder and the Scenes\Studio 4 folder selected as content directories? That could certainly cause problems, you should avoid having both a folder and a sub-directory of that folder selected as a content directory. I was unable to find the files you are referring to. I am not exporting anything. All I am asking for is where does it store the info that is created when a user creates their own categories. Here is an example of what I am talking about. The content is not under the Default category, it is under a more organized method, at least in my opinion. Where is that info stored at? Please select the image for a better view. Export Userdata should cover it. Please select the image for a better view.It stores it in the database. If you want to save it, Export Userdata. you need to export your "user data" to your runtime/support folda. as same as other product meta-data. your modify are saved in the product-meta data. about this case,, you need to re-import your modify product meta-data. I am afraid,,,, you lost your category. when you relfesh your data base. okay thanks, so I don't need to download the "( Inactive )" versions for anything? From what I am gathering by the inactive d/l's is DS will be going back to purchasing different levels of the software like back in the Ds3 days.. I don't think they will . DS 4.6 will delete 4.5 any way . okay thanks, so I don't need to download the "( Inactive )" versions for anything?As near as I can tell, those just show up to confuse you. :) I'll have someone look into that. There seem to be two behaviors - what Studio does with .DAZ scenes and what it does with .DUF scenes. Keeping in mind I am not the expert here, it appears what you said applies to .DAZ scenes. In fact, when DIM came out I had a number of content folders, and decided to start over with DIM in yet another one. In the best of all possible worlds, I could then have archived the old content folders and taken them off my computer. However, in order to be able to open old scenes (owing to what you just said) I needed to add the old folders to the end of my content directory list. This is not very aesthetic and potentially gives rise to duplicates as well. I know of no way to separate what DAZ created for the DAZ files from installed content. Moreover, the generated content is in several folders, depending on. as you say, what was at the top of my list at the time. Aesthetic or not, this procedure does appear to work. The hope is that if and when all the DAZ files are converted to DUF, it won't be necessary to add the old content folders. On the other hand, the auto_adapted directory seems to be associated with DUF scenes. I have only one of these in all my content folders. It is under Scenes and is outside any of my other content directories. With 4.5 the DUF files worked. With 4.6 they do not unless I add it as a content directory. My question is, again, what has changed and how will that impact saving further DUF scenes or converting further DAZ scenes? Neither was selected as a content directory in 4.5. Now Scenes is. That is the one and only place there is a data/auto_adapted directory. It is outside any other content directory. My question is why did it get put there and what will happen in the future. The idea is to get rid of DAZ scenes in favor of DUF scenes. What is the best (and easiest) way to do that? Is it possible it got generated because when I converted the DAZ scenes, not all my old content had been made available to DIM yet? Some information about what auto_adapted is and how it works would certainly help. Haha, thanks Spooky...I'll disregard them then. I am getting constant crashes when using the property editor, this did not happen before. If I create a new property and try to link it to something, I crash. Could you please give an example. Is it possible it got generated because when I converted the DAZ scenes, not all my old content had been made available to DIM yet? Some information about what auto_adapted is and how it works would certainly help.The short answer is there are very serious and numerous reasons that we moved away from the .DAZ format, and even given that, it was a decision that we did not make lightly. This is just one symptom of the issues that are caused by the .DAZ file format. I already did, see if that makes you crash: create a new property on genesis, try to link it to another property or transform, I always crash, if not on the first link, on the second or third.